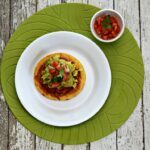 You are here: Home / Recipes / Appetizers / Salvadorean Beef Enchiladas Recipe w/ Club House Taco with Chipotle Skillet Sauce! 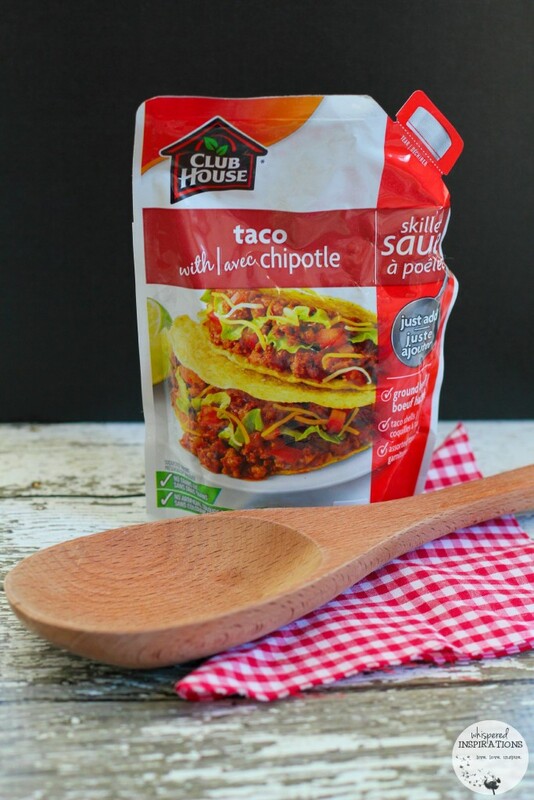 Salvadorean Beef Enchiladas Recipe w/ Club House Taco with Chipotle Skillet Sauce! It’s a world of delicious. There’s something nostalgic about home-cooked meals. Especially when I cook the same meals that my Mom used to make for us growing up. Salvadorean enchiladas were a treat for us and we would have it once in a blue moon. But, when I used to come home to the aroma of fried tortillas and savory beef, oh, I was in heaven. There is nothing like my Mom’s cooking and now that I am a Mom myself, I understand why the enchiladas were a highly coveted treat that we would have on occasion. They take time to make! Making the enchiladas is an art in itself, you have to make them thin, spiced perfectly and fry them. If you’ve done them right, they’ll be crispy on the outside, soft on the inside. So, I decided I would adapt her recipe and make it more meal-plan friendly. That way, I could enjoy a little nostalgia and have a warm meal waiting and on the table come dinner time. I’d take a few shortcuts but, it will all be delicious, you’ll see. Plus, it’s perfect for the fall–it’s warm, nostalgic and delicious. If you’re thinking ‘enchiladas’ they are not exactly what you would think. 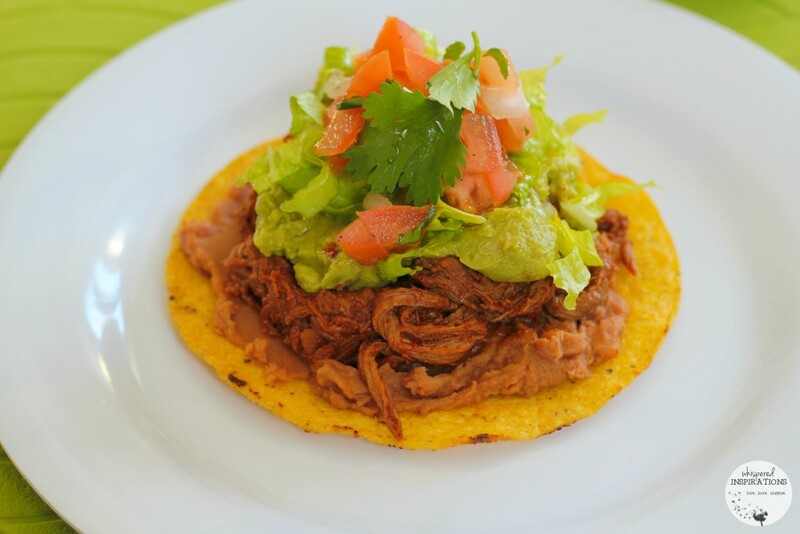 Salvadorean enchiladas resemble tostadas that you may be familiar with. Our version calls for black beans but, my girls prefer pinto. So, that’s what I used. If you have never heard of Club House Skillet Sauces, well, you have been missing out. They are sauces that come prepared and all you have to do is add meat! How super easy is that? Latin Food with a Twist! 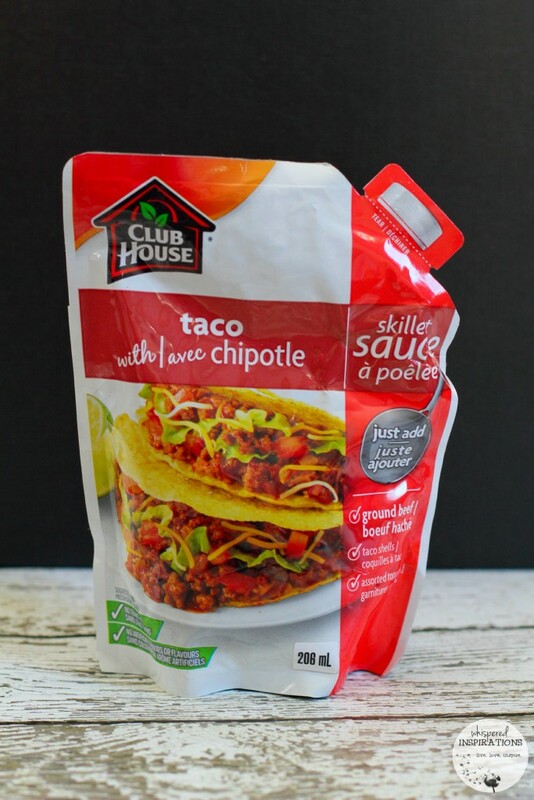 The Club House Taco with Chipotle Skillet Sauce is thick and flavourful. It also has chipotle added for a surprising smoky flavor. While my girls love tacos, I thought that I would give them a new spin on things. I think the last time my Mom made enchiladas were when my oldest was too young to remember. So, this would be a pleasant surprise. But, first, instead of using ground beef–I prepared a roast in the morning, slow-cooked it and it was ready for supper time! This means I was able to go on about my day and dinner pretty much cooked itself! If you don’t want to slow-cook your beef (I find it easier as I prepare it first thing in the morning and it cooks itself,) you can opt for ground beef. Simply brown the beef, season it and add the skillet sauce. In this case, I pulled apart the beef, it literally fell apart on its own and put in a pan, added the skillet sauce. I stirred the beef mixture and let it simmer in the sauce. Boy, did the sauce kick the beef up a notch! It smelled incredible! I prepared a pico de gallo, spicy mashed avocado and chopped lettuce to top the enchiladas with. You can also add sour cream if you are a fan. You serve them warm and then top with the ingredients that you so desire. A simple, quick and easy dinner and I didn’t have to worry about it not tasting good. Club House took care of that for me! This is a delicious adaptation of a Salvadorean classic. It's a quick and easy meal that you can prepare for a week day dinner. One that is easy enough for a fast-paced lifestyle that will leave people wondering if you slaved away all day to make! Dice 3 tomatoes, 1 onion and cilantro. Combine in bowl. Squeeze 2 limes into the mixture and add salt and pepper to taste. Store in fridge until dinner time. Chop lettuce and store in fridge. Combine paprika, adobo, salt, pepper, garlic powder and oregano in bowl and create a dry mix. Rub on dry mix onto beef roast, cover evenly. Add 2 cups of water into slow cooker pan, add 1/2 of chopped onions, 4 crushed garlic cloves and bouillon cube. Let it slow-cook, walk away and go about your day! Once you are ready for dinner, open can of refried beans and heat in a pot. Stir often. Chop peppers finely. cut avocado, remove seed, empty contents into a bowl. Smash to taste. Add salt and pepper to taste. Remove beef from slow-cooker and pull apart the beef. 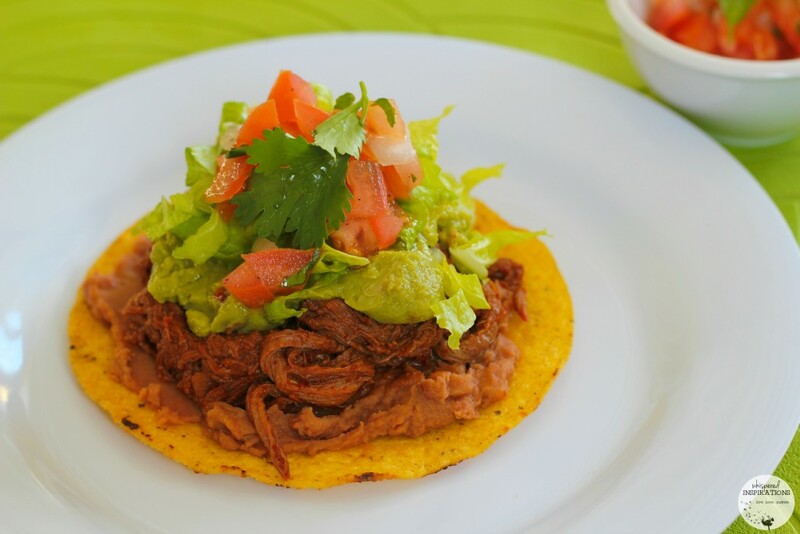 Add beef to skillet or pan, open Club House Taco with Chipotle sauce and add to beef. 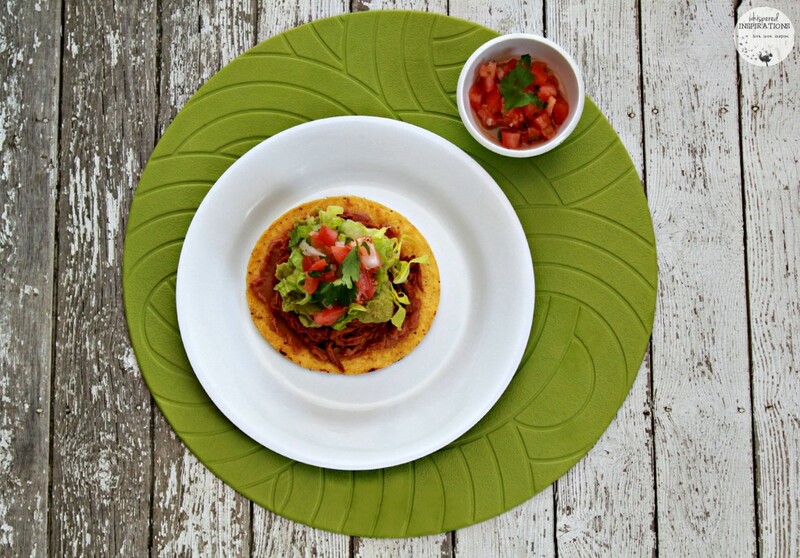 Heat tostadas/charras or enchiladas in oven or microwave (30 seconds) or until heated. Spoon on refried beans onto enchilada. Top with pico de gallo and lettuce. You can use ground beef in this recipe. 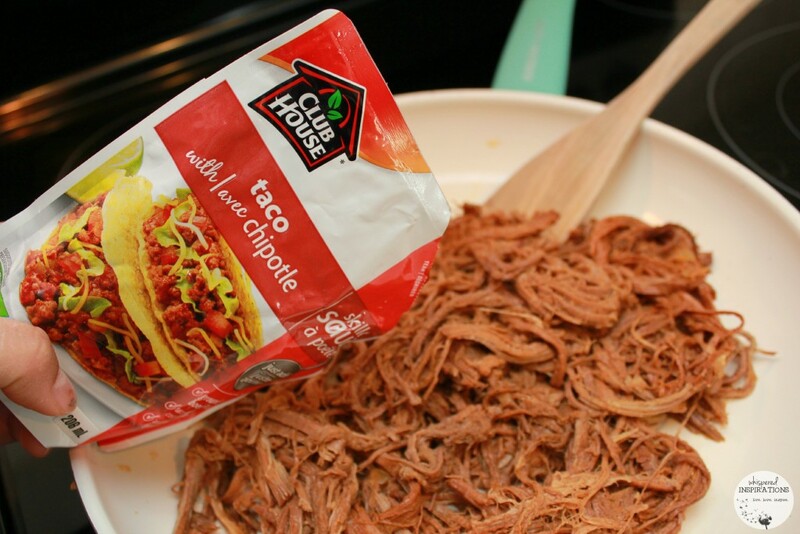 Make sure you use defrosted beef, brown in pan, then add Club House Taco with Chipotle Skillet Sauce. You can add sour cream or cheese if you desire. While they may not be my Mom’s enchiladas, they are similar and parent-friendly. An easy recipe that you can make quickly and one that your family will love. If you aren’t a slow-cooker aficionado, you can always opt for ground beef and you can make this recipe instantly! The girls loved them and my Dara absolutely loved the slow-cooked beef and asked, “Honey, what kind of sauce is this?” and I just said, “Club House Taco with Chipotle Skillet Sauce, baby!” I chuckled because he could tell the difference! I tasted them myself and I was very pleased, not tooting my own horn but, they were good! I know that when the weather starts getting cooler during the Fall; we want something hot to sizzle things up during the week. This recipe is just that, sizzling! Check out Flavour.ca for more recipe inspiration! If you are craving chicken, check out this Sesame Chicken Stir-Fry recipe. 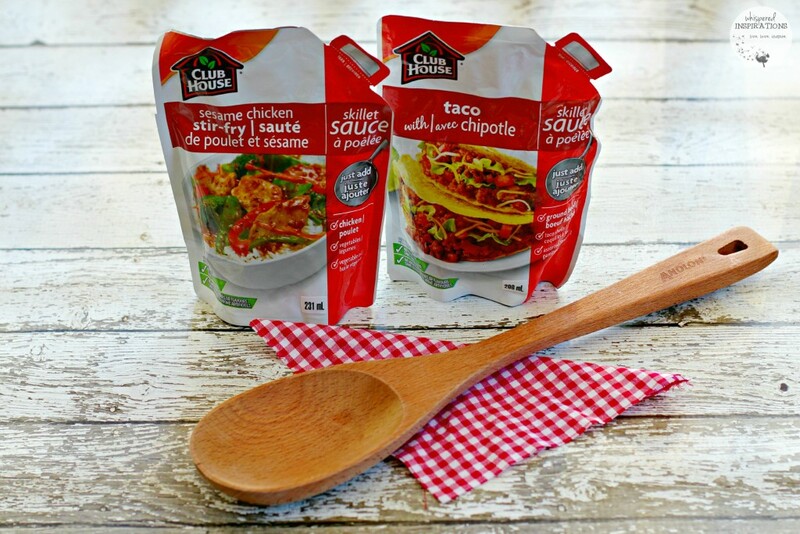 What would you make with Club House Skillet sauces? I love how easy that is! My family would love this. The first thing I'm going to make is this recipe! It sounds amazing. After that, I'm thinking Sesame Chicken Stir-fry. Sweet and Smoky Sloppy Joes sound like just about the best thing ever. Yum! Oh that looks delicious! I want to try to make that for my kids. They will love it but, I warn–it is messy! Um YUM!! I bet my family would love these! I'm going to look for the Steakhouse too! I seriously want to dry your Salvadorean Beef Enchiladas! Looks delicious – plus, trying new food is always fun! Thanks, I hope you would enjoy them if you did. This looks really yummy and easy! There are so many things I could make with this! Lots of possibilities, for sure! 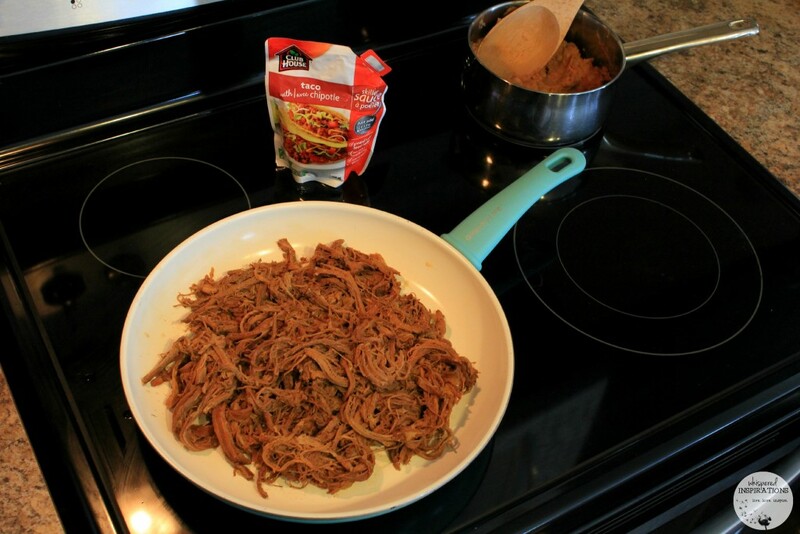 Sesame Chicken Stir-Fry Skillet Sauce – I've never seen these in stores yet? I had not heard off these sauces before!! Your food looks so delicious I had not heard of these before. I would love to try the Roasted Garlic Green Beans & Pancetta! I'd love to try the Sage Rubbed Pork Chops with Wild Mushroom Sauce. 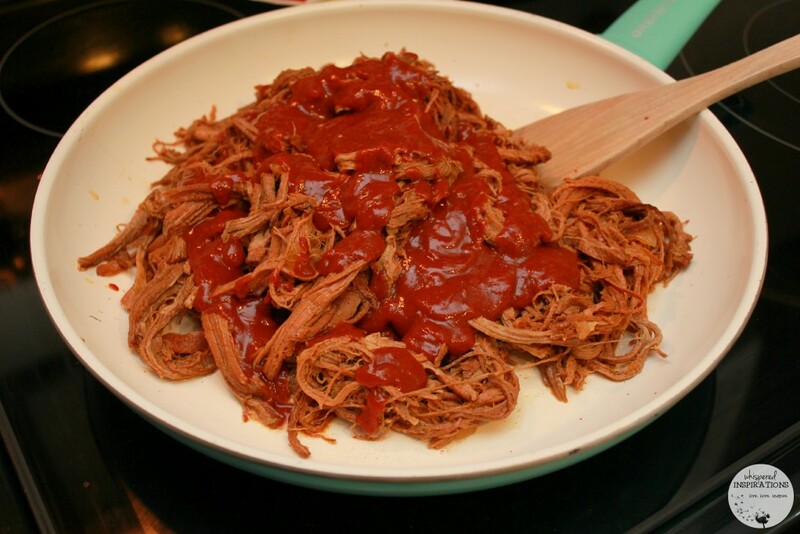 Pork tacos in chipotle sauce! I would like to try the asian lettuce wraps. I"d love the Fire Roasted Garlic Chilli Skillet Sauce………mmmmmmmm there are some to die for recipes there!! I too love the looks of Glazed Brussels Sprouts, but the Cajun Pork Tenderloin Pinwheel looks good. These look so good and easy to make! Thank you for sharing! I would like to try the Montreal Chicken Marinade recipe. Love the ease of recipe. And I love chipotle flavor. I love love love fajitas we have them about once a week. I'd like to try the Cinnamon Apple Muffins. I'd love the Fajita with roasted chili, garlic and lime yum!! OMG I would totally make those Salvadoran Beef Tacos. I love tacos. I'd like to try the Fire Roasted Garlic Chili Skillet Sauce! I'd start with the Sesame Chicken Stir-Fry Skillet Sauce, I could do some great things with that sauce. Wow these pouches look really cool! I love finding easy ways to make a home cooked meal during our busy work week. The Honey-Glazed Salmon Burgers look like a great recipe to try. So many great recipes. I'd like to try the Chicken Honey Stir Fry recipe. Fajita with Roasted Chili, Garlic & Lime sounds delish! Steakhouse Onion Garlic & Herb Cream Cheese Chicken Burger yum! Yorkshire Hamburger Stew looks hearty and warming! I want to try the Sweet Potato Crisps. I would love to try the Pork Tenderloin with Caramelized Onion & Candied Ginger Compote. I would love to try the Sesame Chicken – yum! I like to try the Sesame Chicken Stir-Fry with Snow Peas & Crushed Grilled Peanuts. OOoOOOO Sesame Chicken stir fry sauce! I'd like to make the Sesame Chicken Stir-Fry with Snow Peas & Crushed Grilled Peanuts. I would love to try the Fire Roasted garlic chili skillet sauce! I would love to try the Sesame Chicken Stir-Fry, sounds like something my family would like. I haven't seen these sauces yet when I have been shopping. I would love to make their sesame chicken-YUM! I just saw the commercial yesterday for these sauces! As well as skillet stir-frys, I'd like to try the recipe for Glazed Brussels Sprouts. Sesame Chicken Stir-Fry for sure! We love stir-fry so Sesame Chicken Stir Fry sounds really good! oh my goodness..we loved brussel sprouts here so the glazed brussel sprouts really looks great! MMM I'd love to try the Yorkshire Hamburger Stew, I always run out of ideas of what to do with ground beef! I'd like to try the Creamy Thyme Potato Gratin. Sesame Chicken Stir Fry Skillet Sauce-YUM! Sweet & Smokey Sloppy Joes are sounding good today! The Angel Hair Pasta with Italian Sausage and Herbs looks delish! I want to try the Caribbean Pot Roast recipe. All the sauces in the prize pack sound good. yum to the Sicilian chicken! Id like to try pork tacos in chipotle sauce. Fire Roasted Garlic Chili Skillet! I'd like to also try the Quick Veggie Pizza – looks quick, easy, healthy and yummy! Sesame Chicken Stir-Fry sounds so good, would love to try it! I would love to make Steakhouse Onion Vegetarian Burger with Farro! I would love to try the Steakhouse Onion Garlic & Herb Cream Cheese Chicken Burger. I would choose the Sicilian chicken with tomato basil and garlic. I would love to try the Sicilian Chicken with Tomato, Basil & Garlic recipe. Steakhouse Onion Garlic & Herb Cream Cheese Chicken Burger sounds delicious! I'd love to try the Sicilian Chicken with Tomato, Basil & Garlic sauce! The Hot’n Spicy Beef Chili Soup would be soooo perfect for these frigid winter days and nights! I'd try the Fire Roasted Garlic Chili Skillet Sauce. I'd love to try the Homestyle cranberry sauce recipe. I would like to try the Honey Braised Carrots. Simple and yummy. I'd like to try the recipe for Quick Veggie Pizza. I'd like to try the Chili Meat Loaf recipe. I would love the Sicilian Chicken sauce! Mmh, I'd like to try the quick veggie pizza recipe. I'd love to try the Sicilian Chicken! The Herb-Braised Chicken with Mushrooms and Tomatoes looks like it would make a great dinner. i'd love to make something with the fire roasted garlic chili skiller sauce. The Cajun Fresh Tomato Salsa recipe on their site sounds delicious too!! We've never tried making our own salsa, but we do make a bread with store bought salsa. I bet it would be 100 times tastier with a fresh home made batch. Mmmmm! !